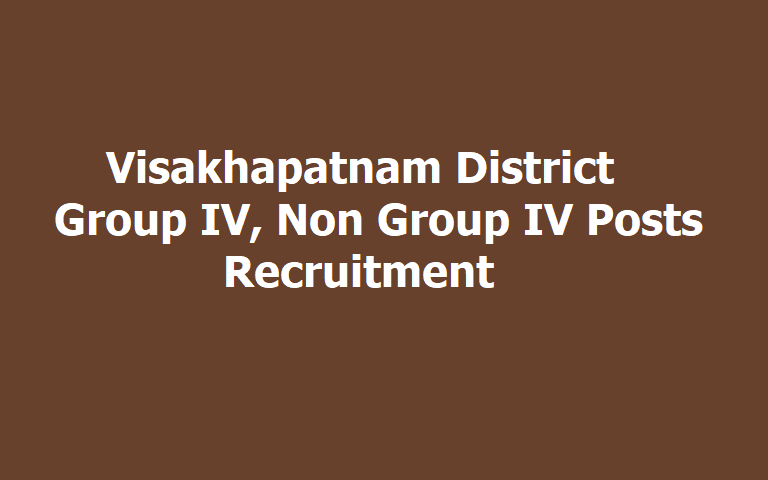 Visakhapatnam District Group IV, Non Group IV Posts Recruitment 2019: Government of Andhra Pradesh, Collector and District Magistrate, Visakhapatnam has issued Group IV and Non Group IV Posts Recruitment Notification and last date to apply is 20-02-2019. The Office invites applications for Special Recruitment Drive in subordinate offices for filling up of Backlog vacancies earmarked for the Differently Abled persons under the purview of other than D.S.C. in the prescribed proforma for appointment of Group IV posts and Non Group IV posts. Qualification: Must have passed Degree with B.Ed. Qualification: Must have passed 7th Class. Qualification: Must have passed SSC. Qualification: Must have passed 5th Class. Qualification: Bachelor’s Degree and qualified in the test of proficiency in office automation with use of Computer and associated software. Qualification: Bachelor’s Degree and qualified in the test of proficiency in office automation with use of Computer and associated software and Passed in Typing Higher, Lower Telugu & English. Qualification: Intermediate Examination, CLISC (Certificate course in Library Science). Age limit: 18 to 52 years of age as on 31.03.2019. Format of application should be neatly typed on a thick white paper. Completed application forms should be sent by registered post or in person in the Office of the Asst. Director, Welfare of Differently Abled, TG & Sr. Citizens, Collector’s Office Complex, Visakhapatnam. 6. One Pass port size photo. If study/residential certificates are not produced the candidate will be treated as a non-local candidate. Candidates must make arrangements to see that communications addressed to them at the addresses stated in their applications are re-directed if necessary. Every effort will be made by The District Collector to take account of changes in candidates address but cannot accept any responsibility in this matter.